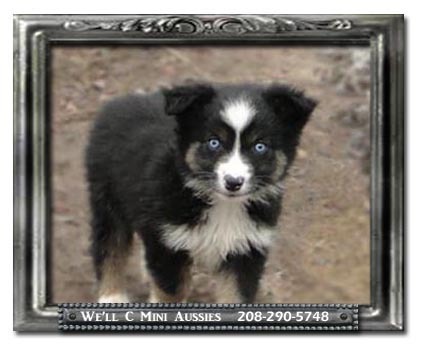 Meet Kelly, one of our double blue eyed black tri (BET) Mini Aussie females. 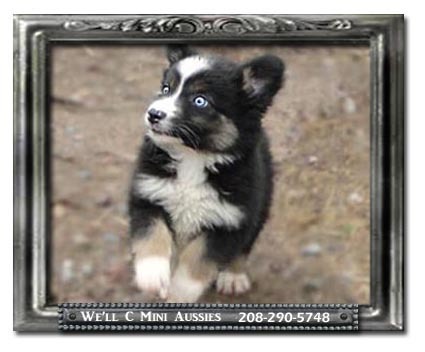 Kelly was born here at We'll C Mini Aussies. She is sired by We'll C A Little Mickey Mouse out of Heifer Creek's Crystal Butts. Kelly was born in December 13, 2014. 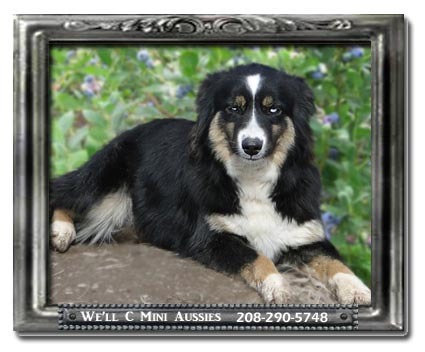 Kelly is registered ASDR, American Stock Dog Registry. She is 16" tall and weighs around 35 pounds. 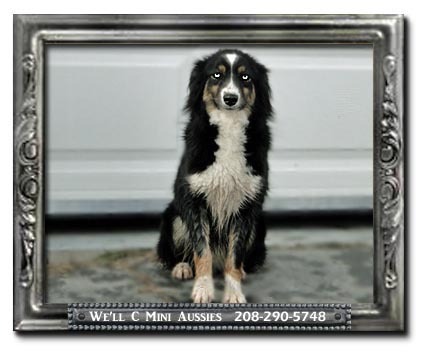 Kelly was super friendly to everyone as a puppy but has matured into a dog that is really pack oriented. She has been a bit stand offish to strangers as a juvenile but now that she has had pups we see her starting to revert back. It is typical that a dog's behavior changes after motherhood. We are seeing this type of behavior out of most of some of the Crystal pups. I think Kelly would be very protective of her family if the need presented itself. 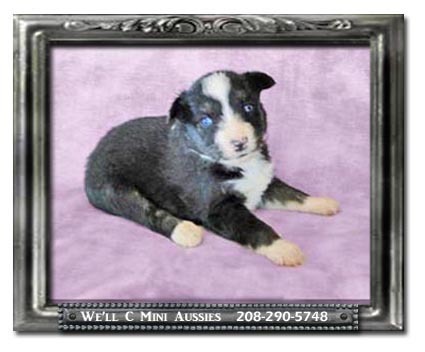 Kelly is a daughter to Mic and Crystal, and a sister to our upcoming breeders Trace, Reba, and Onyx. 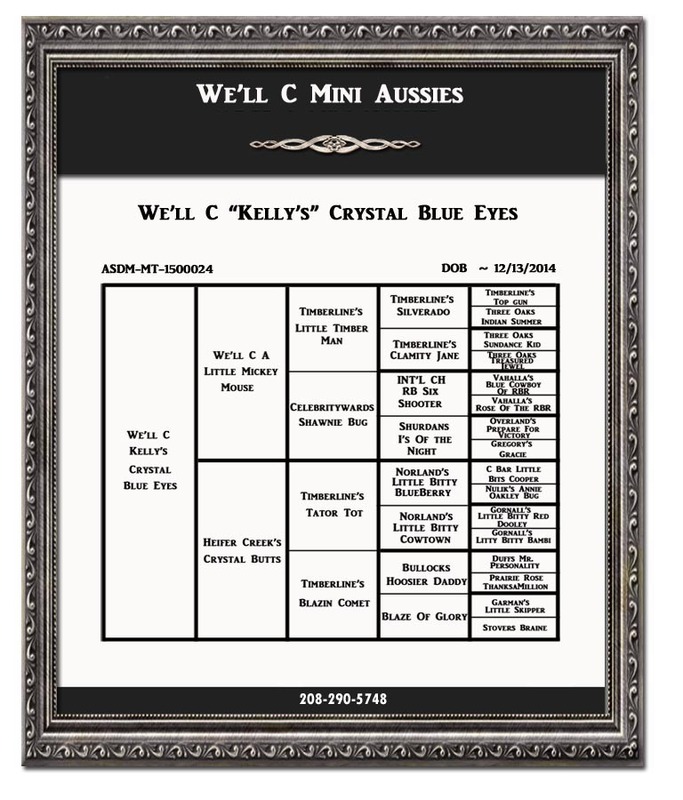 Below is Kelly's slideshow, the results from her genetic testing, and her pedigree. MDR1 ~ Clear by parentage. Kelly has not been tested because neither of her parents are carriers of the gene. Therefore, it is not necessary for us to test as we know she cannot have the mutation. PRA/ PRCD ~ Clear by parentage Kelly has not been tested because neither of her parents are carriers of the gene. Therefore, it is not necessary for us to test as we know she cannot have the mutation.